Early spring puts me in a weird place when it comes to planning what to cook. I no longer want the warm, hearty dishes of winter but the ripe produce of summer hasn't shown up yet. I'm left wanting a fresh, light meal with little option for creating it. I draw a lot of blanks. Last night was no different. I decided on making a pasta salad that I usually do all summer, using produce that can sort of, kind of be counted on year round. While I can't say that the dish was as delightfully flavorful as it will be when I make it in July or August, it was good and it did scratch that itch. A note about the corn... I had planned on just adding canned or frozen corn to the salad but when I went to the grocery, there was a small stack of tiny, barely there, scraggly cobs of corn. I knew they couldn't possibly be good yet but I couldn't resist. Truth is, despite being a crazy .79 cents a cob, they were delicious. Cook the pasta and then pull it out of the boiling water with a slotted spoon or spider instead of dumping it all into a strainer. Immerse pasta in ice water to cool it down. Keep the pasta water boiling and use it to blanch your corn and asparagus quickly before also putting them in ice water to stop the cooking and cool them down. 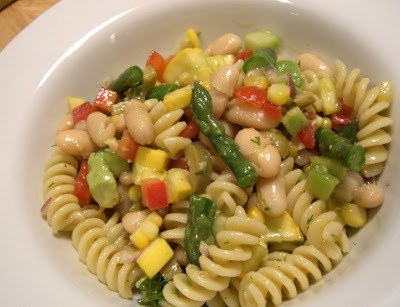 Combine all fresh ingredients together with the cooled pasta and beans. Drizzle with olive oil and season with salt and pepper to taste. What are you making for dinner this time of year?